He is an illustrator of ideas and a painter of emotions, dealing with them with a firmness betraying a real knowledge of human nature. 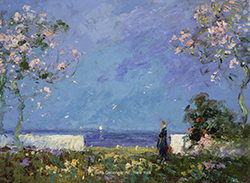 Born in Liverpool in 1864 and raised in Manchester, Tom Mostyn, the son of the artist Edwin Mostyn, studied at the Manchester Academy of Fine Arts. 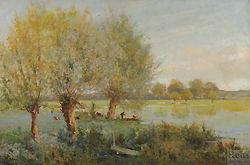 He had his first local exhibition in 1880, and was showing at the Royal Academy by the age of 29. 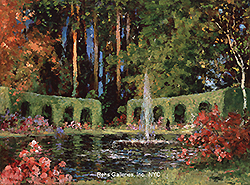 He is mainly recognized for his romantic garden scenes, although his style was so eclectic through out his career that it is hard to believe that the same artist created all of his paintings. His earliest paintings were highly influenced by the strong anti-"Victorian Materialist" sentiment of his teacher Sir Hubert Von Herkomer (whose school he entered in 1893). 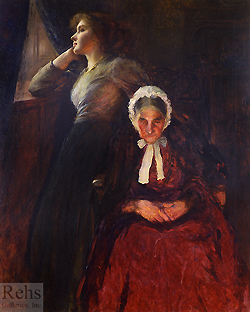 In these early works Mostyn depicted the poverty of the working classes in the style of the realists, an effective way of raising social consciousness. 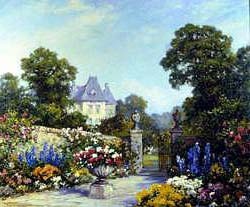 Among his most important works from this period are The Torrent (R.A. 1895), The Dreamers (R.A. 1897) and The Doss-house (R.A. 1905). 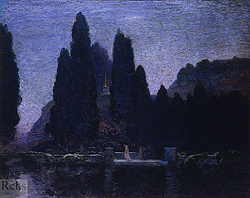 In the late 1890's, Mostyn painted a group of religious paintings for which he received recognition as “…one of the few modern painters who can paint a religious picture with absolute sincerity" (Daily Mail, June 27, 1907). 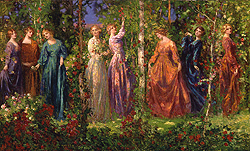 Although he readily changed styles, Mostyn was always praised. 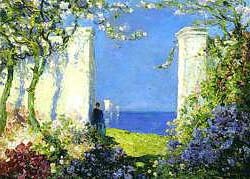 Mostyn’s most important transition took place between 1911 and 1912. 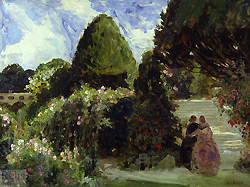 The works from this period feature the large figures, which are so predominant in his earlier works, in sumptuous garden settings – a foreshadowing of things to come. 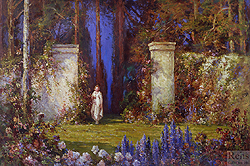 In c.1918 after WWI Tom Mostyn moved to Devon, where he began a series of enchanted garden scenes for which he would become best known. 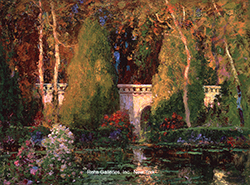 Leaving realism behind, Mostyn began to paint dream-like landscapes, idealizing nature by working with, and building upon, his knowledge of nature's strength and beauty. 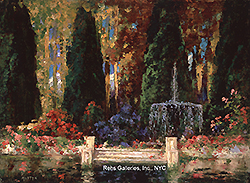 By piling thick layers of intensely bright colors onto the canvas with a palette knife, he overwhelmed the viewer with a barrage of visual stimuli evoking imagination and fantasy. 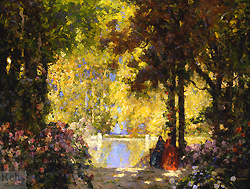 Mostyn was not content to soften down facts and realities by veiling them in an atmosphere of subtle illusion, like so many of the Impressionists did. 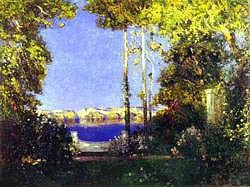 Reality became of small importance to the artist's scheme. Instead he set out to create a world of his own, in which romance was the dominant note. 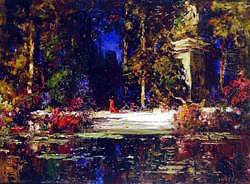 Because of Mostyn's use of color as form these works caused some controversy, and were criticized by some to be little more than "orgies in paint". Mostyn refused to succumb to any of the contemporary fallacies (ie: materialism and technology). He did not confine himself to paint with any set formula nor did he limit his choice of subject matter to any popular mannerism. On the contrary, he felt that every moment called for its individual way of being seen and therefore its unique way of being painted. 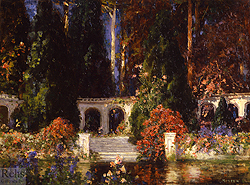 Until his death in 1930, Mostyn's own convictions guided him in a struggle for expression, which became the main influence in his work. 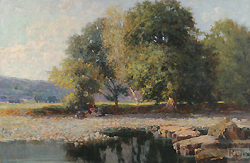 It caused his style to undergo the many changes that we can observe in the body of his work today. 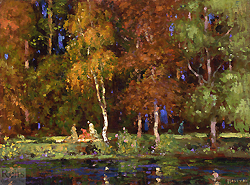 Mostyn exhibited at the Royal Academy, and was a member of the Royal Institute of Oil Painters, The Royal Cambrian Academy, and the Royal West of England Academy. 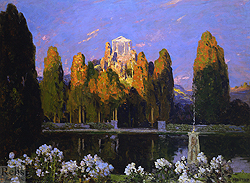 He also exhibited in the Paris Salon, and at the Carnegie Institute, Pittsburgh. The Magazine of Art, Our Rising Artists: Thomas Mostyn. 1899 v.22 p.129-133. 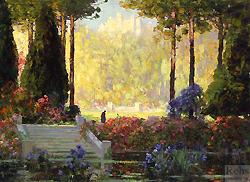 The Antique Collector, Tom Mostyn 'A Full Blooded Romantasist’, November 1989. My School & My Gospel, Sir Hubert Von Herkomer, Archibal Constable & Company, 1908.